When you’re taking out a home insurance policy – whether it’s for buildings, contents or both – one of the questions you’ll always be asked is whether the property has ever been underpinned. If you’ve not insured a property previously, you might be wonder what this means, and what the impact of answering ‘yes’ might be on your premiums. This layman’s guide should help. 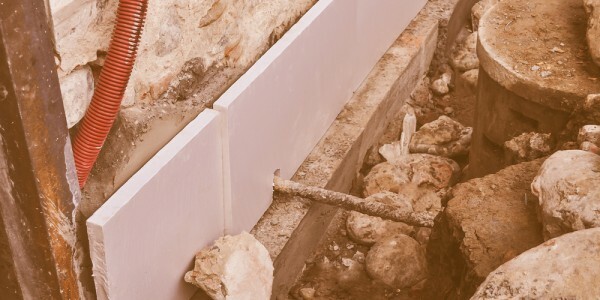 Underpinning a house is the process of strengthening the building’s foundations. This can be required as a result of subsidence (more on this later); the addition of extra floors (including extensions above adjoined garages); or inadequate initial construction. It’s time consuming and expensive to complete. The most typical method involves manually digging out channels beneath the property and filling them with concrete, one at a time. There is often no visible evidence of underpinning work that has been completed previously. Vendors are legally obliged to declare if a property has been previously underpinned, and a structural survey should reveal if a property is likely to require underpinning before you complete the purchase. Rather than start from scratch, it acts to bridge the gap between your home's current foundations and a solid strata of rock that can sufficiently support its weight. The effect is that the current foundations are lengthened, often by many metres – effectively skewering it into the ground, like a fork in a piece of food. The planning and execution of underpinning work is highly specialised and complicated. Why do buildings need underpinning? If you've been told that your home needs underpinning, it's likely because the building is sinking into the ground: a form of subsidence. This can happen because the soil beneath your home has shrunk or moved (as is reasonably common with clay-based soils), or because the ground's characteristics were improperly assessed when the original foundations were laid. Subsidence is more likely to affect semis and detached properties, but in truth any home can be affected. Even mid-terraces built over variable ground, such as old river beds. This issue can be picked up by a structural survey before purchase. It’s important to note that your survey won't pick up if a neighbouring property, such as the other half of a semi-detached, has been underpinned. If you're looking at buying a home in an area with clay soil (particularly prevalent in the Southeast of England), don't be afraid to knock on nearby doors and ask if their property has been underpinned in the past. Signs of potential subsidence include cracks in the brickwork or render, and blown tiling on interior walls. Several things can cause blown tiles, including leaking pipes, so their presence should ring alarm bells – they mean something, somewhere is wrong. Homebuilding & Renovating magazine places the ballpark figure of underpinning an average British home at £10,000 to £15,000. Of course, if your home is larger the costs could be far more significant. My home needs underpinning. Can I claim the cost on my home insurance? It depends on the reason why the work needs to be done. Most instances of subsidence are insured, and the cost of stabilising your property will be covered by your insurance. If it is because of a newly planned extension or other elective changes to the structure of the building, this will not be insured. You won’t be able to claim for underpinning if your property is experiencing subsidence while still covered by the new building warranty that typically comes with all new or recently built properties. In these instances, the home builder will be responsible for stabilising the property. Can underpinning make home insurance more expensive? Insurance is all about assessing risk. Potential home insurers will want to know if they’re exposing themselves to an increased risk. Underpinned properties are considered riskier because it indicates that the property may be structurally unsound, or have imperfect sub-optimal foundations. While in theory the property should be more secure than before, there are no guarantees that it won’t require further structural work. That said, historical underpinning may have less of an impact on your premiums than recent work; if there has been no further movement of the ground in decades since it was completed, the likelihood is that the problems have been largely solved. If the vendor/estate agent misled you about historical work that has been completed to the property by failing to declare it on the Property Information Form, you may be able to sue; buyers are protected by the Misrepresentation Act (1967). If sellers fail to declare underpinning and this later comes to light, they must prove they didn’t know about it. Of course, there may be a paper trail proving they were informed when they bought the property. Any legal expenses you incur in suing the seller may be covered through your home insurance. To be covered, you will need to have selected Family Legal Protection as an optional extra, or opted for a policy that includes it as standard (such as Admiral Platinum buildings insurance). The heatwave this summer caused problems for homeowners. Get the right cover for your unique home.